Bentley Motors has announced the introduction of the Continental GTC. The new luxury 2+2 convertible completes the Bentley Continental model range following the introduction of the highly successful Continental GT in 2003 and four-door Continental Flying Spur earlier this year. The new Continental GTC goes on sale in late 2006. With a top speed in excess of 304 km/h (190mph), a sophisticated all-wheel drive system, state-of-the-art 12-cylinder engine, advanced air suspension and ultra-stiff body structure, the Continental GTC displays all the poise, exhilarating performance and dynamic handling of the Continental GT. In common with its stable mates, the interior of the new Continental GTC provides an unrivalled standard of craftsmanship, utilising natural wood veneers and leather hides of the finest quality. While sharing the familiar face of the Continental family, the design personality of the new Continental GTC is distinctive and unique, as Bentley’s design director Dirk van Braeckel explains: “With the Continental GTC we set out to achieve a style that is both contemporary and elegant but with the sporting stance of a true performance car. We also wanted to ensure that the Continental GTC looks just as beautiful with the roof up as it does when it’s down. 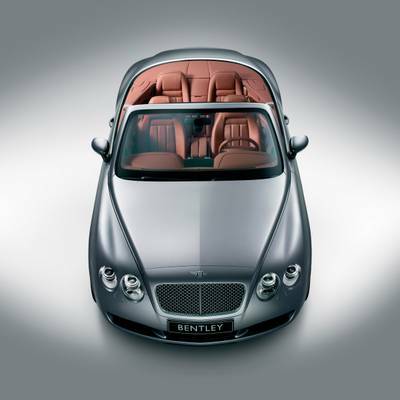 The Continental GTC becomes the second convertible to grace the current Bentley range. It follows the recently announced return of the evocative Azure name for Bentley’s Arnage-derived flagship four-seater convertible which goes on sale in the northern spring of 2006. Further details, including full technical specification, market availability and pricing will be released nearer to the Continental GTC’s on-sale date.